Aborting Humanae Vitae: How Can the Church Deal with the Bergoglian Quantum Leap? The conventional wisdom is that “this disastrous papacy” lies on a continuum of post-Vatican II ecclesial decline on which Francis represents but the lowest point yet reached. This is true, but only superficially. If we look more deeply into the phenomenon that Antonio Socci has dubbed Bergoglianism, we see an actual break with the continuum, a quantum leap into the chaotic realm of the mind of one badly formed Jesuit, fascinated by his own disordered thinking. “After US President Donald Trump reinstated the Mexico City Policy, Ploumen launched a new NGO called She Decides to provide mass amounts of funds to organizations that would no longer receive funds from the US government. The Mexico City Policy automatically denies US funding for international organizations which perform or promote abortion. “Referring to the Mexico City Policy as a ‘Global Gag Rule,’ Ploumen stated that the intention of She Decides was to continue support for existing programs being run by organizations such as the United Nations Population Fund (UNPFA), the International Planned Parenthood Federation and Marie Stopes International. She said, ‘These are successful and effective programs: direct support, distributing condoms, making sure women are accompanied at the birth, and making sure abortion is safe if they have no other choice. By July of 2017, Ploumen’s program had raised over $300 million." Let this sink in: in the name of Pope Gregory the Great, a wayward successor on the Chair of Peter has conferred the dignity of a papal knighthood on a woman who declares publicly her undying commitment to “making sure abortion is safe if they have no other choice.” Let no one object that Francis merely provided a pro forma papal blessing to a ceremonial honorific. He surely knows the worldwide scandal this has caused, but just as surely will never revoke the honor. Message received! Meanwhile, the entire Church is expected to hang on Francis’s every word concerning this or that matter which preoccupies him, for as he has made clear in one of his multitude of infamous interviews: “I’m constantly making statements, giving homilies. That’s magisterium.” Constantly indeed! And this constant stream of “magisterium” includes the obsessive repetition of Francis’s opinion on the imaginary moral duty of European nations to welcome their invasion by endless waves of “migrants” and “refugees” the large majority of whom are military age Muslim males. The most recent example is a sermon on the World Day of Migrants and Refugees. In today’s world, for the newly arrived, to welcome, to know and to recognize means to know and respect the laws, culture and traditions of the countries in which they are welcomed…. It is not easy to enter into the culture of others, to put ourselves in the shoes of people so different from us, to understand their thoughts and experiences. And so often we give up the meeting with the other and raise barriers to defend ourselves. Local communities sometimes fear that newcomers disturb the established order, “robbing” something that has been painstakingly constructed. Even the newcomers have fears: they fear confrontation, judgment, discrimination, failure. These fears are legitimate, based on doubts that are fully understandable from a human point of view. Having doubts and fears is not a sin. Sin is to let these fears determine our responses, condition our choices, compromise respect and generosity, feed hatred and rejection. Sin is to renounce the encounter with the other, the encounter with the different, the encounter with others, which in fact is a privileged opportunity to meet the Lord. To summarize this double-talk: (a) “migrants” and “refugees” (i.e., basically hordes of well-fed, military age Muslims) should respect the laws, culture and traditions of the European nations into which they are swarming; (b) fears that millions of Muslim “migrants” and “refugees” will not respect “laws, culture and traditions” of European nations, particularly in local communities, are legitimate and fully understandable; but (c) civil authorities would sin if they based their immigration policy decisions on legitimate and understandable fears about the effects of Muslim mass migration. So, according to Francis, calling a halt to mass Muslim migration, or even sharply restricting it, would be sinful. But living in a state that the Catechism of John Paul II calls “permanent and public adultery” is not sinful for many in that state, nor is it any impediment to their reception of Holy Communion, given their “complex circumstances.” No “complex circumstances,” however, would justify halting or restricting Muslim mass migration, even based on legitimate and understandable fears about its effects. 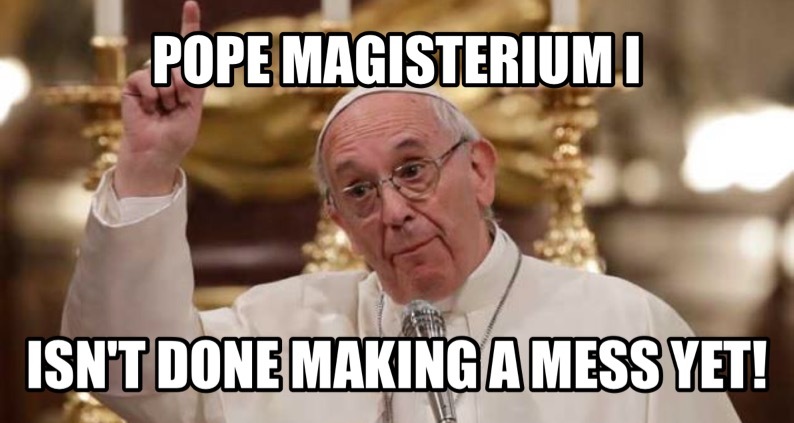 Confronted with rising opposition to his novelties, Francis has dared to affix the label Authentic Magisterium® to his approval of Holy Communion for public adulterers, even though it introduces “a discipline alien to the entire Tradition of the Catholic and Apostolic faith.” Doubtless he would, if he deemed it expedient, apply the same label to his view that the “welcoming” of an indiscriminate number of “migrants” and “refugees” is a moral imperative of nations and that its rejection is sinful. The label as applied by Francis deserves the mockery of the registered trademark symbol because, by standing in opposition to all his predecessors on a matter as fundamental as the sin of public adultery and its consequences respecting the discipline of the Sacraments, Francis himself forfeits any claim that his personal brand of thought can be identified with the perennial Magisterium of the Holy Catholic Church. With each passing day of “this disastrous pontificate,” the distinction between what Francis thinks and what the Magisterium teaches impresses itself ever more deeply on the Catholic mind. As Pope Francis continues his five-year-long tirade against the imaginary Catholic Pharisees who defend the Church’s teaching on the indissolubility of marriage and the integrally related Eucharistic discipline—he is still at it as of yesterday (January 9)—he and his collaborators are busily engineering neo-Pharisaical escape hatches from the negative precepts of the divine and natural law emanating from the Sixth Commandment. The End of the Church of Slogans? Like every other propaganda theme concocted by the Vatican apparatus since Vatican II, including “the conciliar springtime,” “dialogue with the world,” “the liturgical renewal,” “the ecumenical venture” and “the New Evangelization,” the theme of “Francis the Great Reformer” is a hoax that conceals an underlying, ever-worsening state of ecclesial dissolution whose scope is without precedent in Church history. “Francis the Great Reformer” was supposed to accomplish the mighty work of converting a “self-referential” Church into the “Church of the Poor”—another hoax—with the aid of a Council of Cardinals—yet another hoax—that would help him reform the Roman Curia and decentralize Roman authority in favor of “the peripheries”—still another hoax. But Francis’s handpicked coordinator of the Council, Cardinal Oscar (“Mad Dog”) Rodríguez Maradiaga of Honduras, has just been exposed as a financial huckster thriving on the backs of the poor about which he pontificates constantly in the usual manner of a Latin American leftist ideologue. Is anyone surprised? Before discussing the details of the scandal and its significance for the Church at large, a few words about the Cardinal’s background are in order. At this point in the Bergoglian Debacle, the recognition that Francis is a threat to the integrity of the Faith has become so well established in mainstream commentary that even an Anglican theologian, writing in First Things, has sounded the alarm. Traditionalists are often derided by neo-Catholic commentators for relying on supposedly apocryphal quotations from Popes or saints bearing on the current ecclesial crisis. But these critics never demonstrate that the oft-cited quotations are apocryphal; they merely assert that they must be, as they seem too probative to be true. This is often done in comment boxes or responses to online queries at neo-Catholic websites, wherein the neo-Catholic commentator professes he can find no source for a given quotation—meaning he hasn’t bothered to do any serious investigation beyond a few Google searches. By now the whole Catholic world has heard of the publication of a devastating letter to Pope Francis from Father Thomas G. Weinandy. The former head of the theological secretariat of the U.S. Bishop’s conference, Fr. Weinandy has taught at both Oxford and the Pontifical Gregorian University in Rome. None other than Francis appointed Fr. Weinandy to the International Theological Commission and awarded him the Pro Pontifice et Ecclesiae medal, the ecclesial equivalent of the Congressional Medal of Honor, for his work on behalf of the Pope and the Church. One of the world’s most renowned theologians, Fr. Weinandy is a “man of the Council” and a prominent figure of the post-conciliar mainstream.